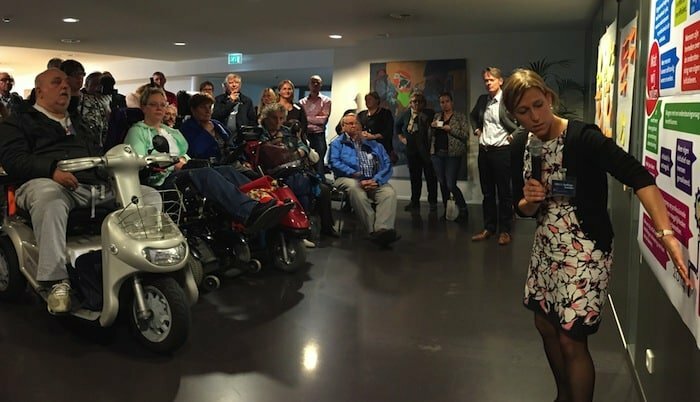 On Tuesday the 15th of September 2015, the Mosae Forum in Maastricht fills up with people for the City Round on the Social Domain. These people come to talk about the three decentralisations: social support (Wmo), youth welfare and work & income. These decentralisations are prime examples of complex issues where many stakeholders are involved and where blueprints do not work. The council working group Social Domain asks Perspectivity’s Petra de Boer to help design and facilitate a dialogue session. Current practice: what goes well and what problems are we running into? Ambitions: what do we want to realize in 2018? Eighty people work together in small, heterogenous groups. The evening is fruitful. Many stakeholders are present, from citizens to carers to professionals, politicians and policy makers. There is space for each person’s perspective. The dialogue helps to understand each other better and to come to new insights and solutions together. Citizens, policy makers, volunteers, they are not from separate worlds. We can and have to shape change together. Our interest are communal and the same goes for our goal.